The race will be held from September 25-30 and it will have a maximum of 500 runners. This morning, Fuerteventura hosted the official presentation of the Half Marathon des Sables, a spectacular stages race which will take place between the 25th and the 30th of September 2017. 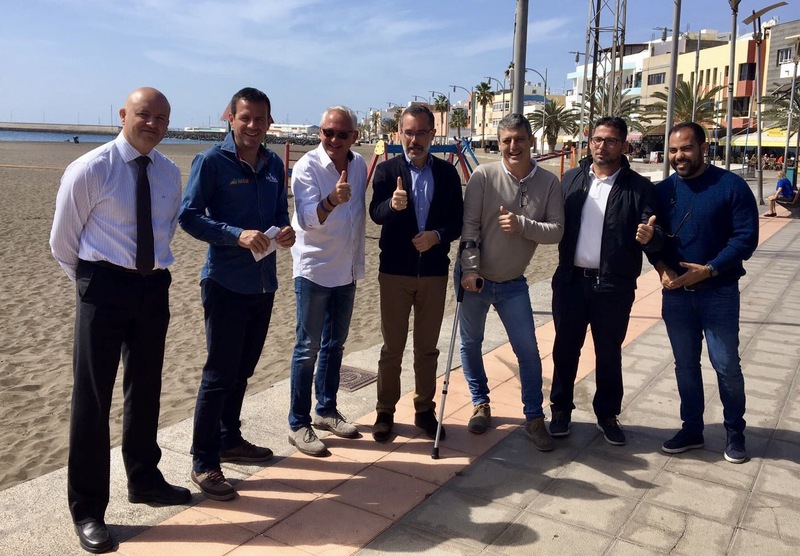 The president of the Cabildo de Fuerteventura, Marcial Morales, the race’s directors, Patrick Bauer and Fernando González, and Mario Valle in behalf of Playitas Resort assisted to the act. The legendary Marathon des Sables has been held in Morocco since 1986, and it is one of the most famous stage races all over the planet. It will now expand to Europe and America. Fuerteventura has been the selected place for it, as Marcial Morales explained: The European edition will be in the South of Fuerteventura, which gathers the required conditions for an international, self-sufficiency race as this one. This will mean an enormous boost for the island as sports destinations”. This first edition will have a maximum of 500 runners coming from all over the World, who will be the best promoters of Fuerteventura’s beauties and its perfect conditions as a destination for this sport which has experimented such an enormous growth in the last years. The sandy and desert-like landscapes in Fuerteventura will be essential for this kind of event. This is one of the reasons why Patrick Bauer, the race’s founder, chose this place in the Canary Islands for it. Patrick Bauer wanted to thank the collaboration of all the administrations which will make the Half Marathon des Sables Fuerteventura possible. He described the island as wild, with a unique nature and with similar weather conditions as Morocco. Bauer revealed that the event will take place from the 25th to the 30th of September 2017. The race will have the the same philosophy as the original one: a multi-stage event, in self-sufficiency where you fight against yourself in a desert like landscape. The total distance will be of 120 kilometres, divided in a yet undefined number of stages. The race will have a couple of basecamps during the course, starting from the South of Fuerteventura and ending in Gran Tarajal. 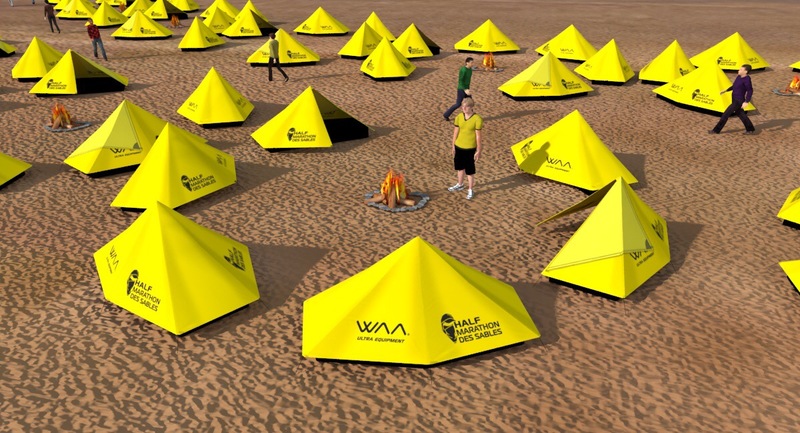 All the runners who are accepted for the challenge will receive a specific WAA tent, where they will be able to sleep during the race, as well as some carbon hiking poles. Bauer wanted the presence of Arista Eventos in the direction of this prestigious multi-stage event. Thus, Fernando González and David Déniz, managers of the company in charge of races such as Transgrancanaria HG or Haría Extreme Lanzarote, were both present in the presentation. Amongst other tasks, Arista will handle the logistics of this massive event. To learn about the philosophy of the race, they will assist to Morocco in April to live the African event. Mario Valle, in behalf of Playitas Resort, was also in the presentation as they will also collaborate with the event. “We’ve been promoting the sports and high quality tourism, and that is why we will support the celebration of the Half Marathon des Sables in Fuerteventura, in collaboration with the Cabildo de Fuerteventura with the only goal of having a successful event”, he stated. The island of Gran Canaria once again hosted the Transgrancanaria series of races. Over the years, the races have grown not only in stature and entries but also in quantity. In total, there are now seven races and this year the addition of the TRANS 360 (265km) really has elevated the race portfolio so that TRANSGRANCANARIA now contrasts and compares directly to the UTMB series of races. Starting with a FAMILY race (17km) you then have PROMO (17km), STARTER (30km), MARATHON (42km), ADVANCED (82km), the TRANS 360 and then the main event of the weekend, TRANSGRANCANARIA at 125km and 8000m of vertical gain. Over the year’s, TRANSGRANCANARIA has had the world best come to this Canary island and do battle. Ryan Sandes, Sebsatien Chaigneau, Nuria Picas and Caroline Chaverot are amongst the winners and the 2017 edition, like previous years, had a high quality field. Notably, the 2017 edition is also earlier in the year, in the past, the race has been in March. This is significant, the 125km race is tough at anytime of the year but coming so early means that the end of one season and the beginning of the next becomes increasingly cloudy. If you want to do well here, it’s fair to say that the previous year’s season needs to end in September or October to allow for recovery and then building training once again to be ready in February. Caroline Chaverot and Didrick Hermansen were 2016 returning champions and without doubt they were pre-race favourites. Didrick most definitely would have a fight on his hands with the final result going anyway. By contrast, Caroline after an incredible 2016 season was almost guaranteed a victory. But this is ultra-running and things don’t always go the way you expect. From the off, Pau Capell and Azara Garcia dictated the race from the front and by the time they reached Artenara (approx 30km), the duo had a convincing lead in their respective races. Many had predicted pre-race that 2017 was Pau’s year, however, Azara was stepping up to the 125km distance – she normally races hilly, technical mountain races of marathon distance, so, stepping up to 125km and 8000m of vert was going to be a challenge. The Spanish duo most certainly had some highs and lows on an incredible journey to the line but they didn’t falter. Pau looked to be a man on a mission throughout the race and although he went through a bad patch in the last 20km, he rallied and then continued to pull away to take one of the biggest victories of his life. Azara battled and battled and from Roque Nublio looked tired and maybe a little bit broken. Somehow she managed to find the mental strength to beat and will her body to the line. She finished with a convincing lead over 2nd lady Andrea Huser, but Azara was an empty shell on the line. She was broken and the emotion of the biggest win of her career seemed all too much as she sat lost in her exhaustion. Eventually she was stretchered away to recover. Behind two amazing performances were the highs and lows of the ultra world. In the ladies’ race we saw Caroline Chaverot drop from the race at Artenara lacking energy with tired legs. We saw Andrea Huser produce an ever-consistent and well placed performance to place 2nd and gain another high-ranking podium place and Melanie Rousset from France rallied to finish 3rd ahead of Kirstin Berglund. Full ladies’ results HERE. The men’s race was a cracker, however, everyone was running in the wake of Pau Capell who produced a dominating world-class performance. Vlaidas Zlabys from Lithuania was the revelationn of the race and a name to note for the future. Right from the beginning he was in the mix and he produced a strong, consistent and well paced performance to finish 2nd 14:35 minutes behind Pau. In the final 20km he had closed that gap down to 10-minutes but Pau surged. Didrick Hermansen ran much of the race off the podium but he knows his strength. In the last 3rd of the race he closed hard and moved up through the race to finally finish on the podium in 3rd – a great result! Behind the top-3 is a story of trials and tribulations, pre-race favourites of Andy Symonds, Diego Pazos and Timothy Olson all finished in the top-10 but it was stories of niggles, sickness, fatigue and fighting a cold and challenging night. Full men’s results HERE. The 2017 edition of the race will be remembered for a very cold and windy night that challenged the runners. Even the arrival of daylight did not warm the ambient temperature in the mountains. It was only as the runners descended to the sea in the final 20-30km’s did temperatures rise and of course, this brings it’s own problems. From 4-degrees to 25-degrees is a tough ask. The challenge was clearly seen on each runners face. Pau Capell and Azara Garcia are the names of 2017, I wonder, who will be the names of 2018? The 4th edition of the Berghaus Dragon’s Back Race takes place this May 22nd-26th 2017. The original race first took place in 1992 before being rekindled in 2012 by Ouea Events – the brainchild of Shane Ohly. The 2017 edition of the race, sold out in less than 14-days and now, with just under 3 months to go, Ourea Events have a definitive list of those who will toe the line – 23 nationalities will be represented at the 2017 event. Ourea Events are also delighted to welcome back the Berghaus Relay team who are offered the unique opportunity to split the 5-day race between 5 of their staff, handing over the baton at each overnight camp. Berghaus’s commitment to both the upcoming 2017 and 2019 editions of the race allows organisers to further cement the event’s world-class reputation in delivering a superb participant experience, live GPS tracking for a worldwide audience, and in daily releases of film footage and photography. Congregating at the start line at 7am on May 22nd inside the walls of Conwy Castle, 270 participants will take a first step on one of the ultimate running tests not only in the UK but the world. They will embark south on an incredible journey along the mountainous spine of Wales the Dragons Back! The 2015 route will remain mostly unchanged,and features one of the most punishing first days of any multi-stage race, tackling all but 3 of the 14 Welsh 3000s. Day 2 once again heads into some of the roughest and most arduous terrain in the UK; the craggy, heather-infested Rhinogs. “Think like a sheep” was advice anecdotally presented to 2015 participants by Race Director Shane Ohly in order to navigate through the myriad of faint trods. Statistically, if participants make it through both this and the following (longest – 68.3km) day, they are most likely to finish the full race. A 60-strong event team, a large proportion of which are volunteers, who take responsibility for campsite builds, checkpoint placing, mountain safety, media coverage, catering, and much more make this event possible, without them, there would be no event! National Trust Wales, the National Parks, and landowners are equally valuable to the smooth progress of the race. A full preview of the race and who we can expect to feature in the overall rankings will follow, however, as a teaser, here is a few names to whet the appetite. Jez Bragg will return after running in the 2015 event and Marcus Scotney, winner of the Cape Wrath Ultra will also toe the line. Carol Morgan will without doubt be a name to watch in the ladies’ race as will Sabrina Verjee – this is just the tip of the iceberg. A full preview to follow. Winners of the 2015 event were Jim Mann and Jasmin Paris. The best way to describe stage 4 is a potpourri of running experiences. Stage 4 which was 36.2km long started with the runners being dropped off by coach at the start Coronado. At 5:30 the start was given and after an initial warm-up on flat gravelly road, the runners went up a steep descent climbing until CP1 at 5.9km. After CP1, the climb continued on single track in shaded and dense forest undergrowth. At 10km the runners reached the summit and highest point of the course. From there on followed a succession of rolling hills on an undulating course to CP2 at 12.7km. The course was a mix of grassy trail and forest fire trail. Temperatures at this height were a lot cooler and there was a pleasant breeze and quite a lot of shade until CP3 at 19.1km where the adventure category started. After CP3 aka Donkey’s Hill, the runners continued on a relentlessly hilly rollercoaster course. At 24km the course took them down a grassy descent to a shaded river-bed section where the runners had to contend with running on slippery stony riverbed and across moss-covered rocks on the embankment, ducking jungle undergrowth and overhanging branches. This provided most with respite from already soaring temperatures. The riverbed section lasted about 4km and was followed by a very steep climb and a few long hills, which offered little shade from the sun which was starting to beat down on already tired runners. After a summit at 1000m, the runners started the final descent in what looked like an earthy tobogganing slope – a downhill vertical VK to reach sea-level in 4km. After that followed a final river crossing and 3km through Palmar Sur to the finish line. Buses took the finishers to the overnight campsite along a river. The total ascent of stage 4 was 1767m and the descent 1770km. True to his reputation, Tom Owens took the lead from the start running hard and was first at CP2 at the top of the initial climb. Jason Schlarb was in second position, followed by Chema Martinez who was working hard. In fourth was Erick Aguero who was looking very strong. After CP3 Chema was closing the gap on Jason who was “enjoying the trail” until he looked over his shoulder to see Chema ominously threatening his second place. Jason put his foot down and reopened the gap, dropping Chema. Then Costa Rican Erick Aguero caught up with Chema in the descent to the riverbed securing third, pulling away comfortably in the riverbed section and nailing it on the ensuing hills. Tom crossed the finish line first, followed by Jason Schlarb and to complete the podium today Erick Aguero. Chema Martinez was 4th and although he said he felt better he had to concede that he struggles to keep up when the trails become technical and hilly. In the Ladies Race Anna Frost took the lead from the beginning. However, at CP2 and CP3 she only had a couple of minutes over Anna Comet. Elisabet Barnes finished fifth today after Frosty, Anna Comet came in second, Ester Alves was third and Costa Rican Katelyn Tocci fourth.